We have decided to move the High Point Ireland Blog to WordPress. Cairngaver is a little known and relatively low, transmitter-topped hill in north County Down. 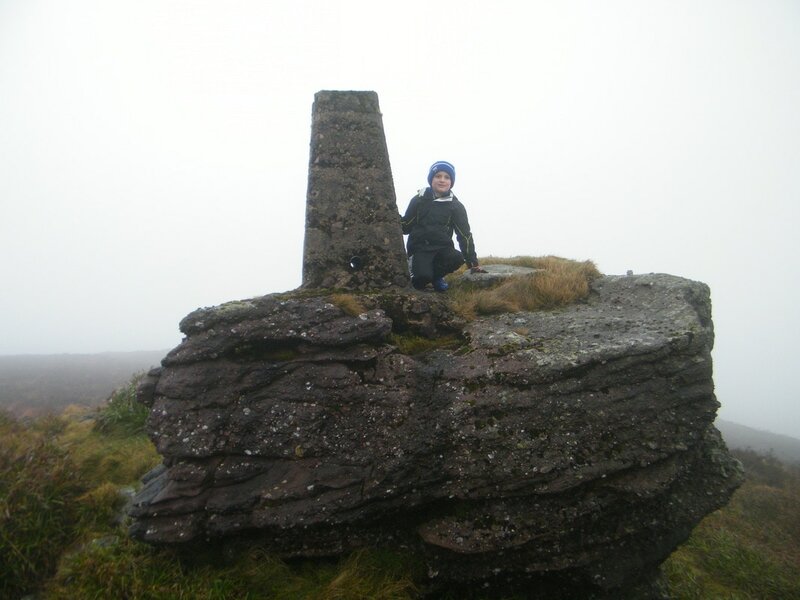 Its 217m summit is the highest point in the Craigantlet Hills - a small range just northeast of Belfast City. Read Martin McAlinden's story of his second attempt to reach its summit. I’m slightly embarrassed now that I was unable to reach the 217m summit of Cairngaver on my first attempt back in 2009. In my defence, this was before the age of widespread smartphones equipped with hiking apps, GPS and 4G. I’d arrived somewhat ill-prepared following an appointment nearby, without a map and with only the knowledge that the summit lay beyond the top of Cairn Wood, a pretty forest popular with walkers. I’d followed the maze of trails ever upwards without any luck, ultimately reaching a quarry and not finding an obvious route beyond it. I decided to give Cairngaver another go recently, after visiting a friend living in Belfast. This time I was armed with the ViewRanger app which helpfully shows the main trails through the forest. Once again I started from the forest parking area on the B170, an inland route between Belfast and Bangor. I followed the main perimeter trail up to the top of the forest and then, knowing I should be aiming southeast, picked up a minor trail which gave a glimpse of the transmitters and led towards them. The summit area was reached after passing through gaps in a couple of hedges. Having skirted the quarry edge again, I realised that my mistake last time was thinking the summit was to the right of it rather than the left. Despite the various masts and service buildings, Cairngaver’s summit is quite a peaceful place, with a trig pillar topping an old cairn that’s shaded by trees. The views are surprisingly extensive, though you’ll have to walk around a bit to appreciate them. One thing that struck me was that this area of commuter towns is still very green and pretty when seen from above. Sights included part of Belfast and its surrounding hills, the familiar, jagged line of the Mourne Mountains to the south, the mouth of Belfast Lough and the Antrim Coast to the northeast, and across the sea to Scotland and even the Isle of Man; the first time I’ve been sure I’ve seen it from Ireland. 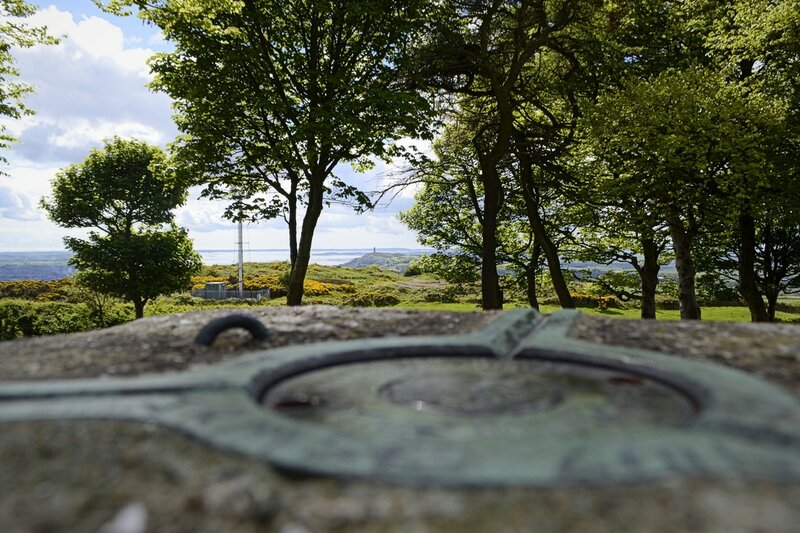 Closer to hand was the fairytale Scrabo Tower rising above Newtownards, with the Ards Peninsula beyond. Having taken time to enjoy the various views, I headed back down the same way. This was a very enjoyable trip, not just because of the satisfaction in finally ‘conquering’ this obscure hill but because Cairngaver punches well above its modest height. This is a short version of an article from Martin McAlinden's own Hike Cycle Ireland blog. For the full story and a larger selection of photographs from Martin's Cairngaver walk, please visit his original article. ​As part of his mission to develop and promote high point bagging in Ireland, Kieron Gribbon has taken this informal leisure activity and transformed it into a brand new sport for all. 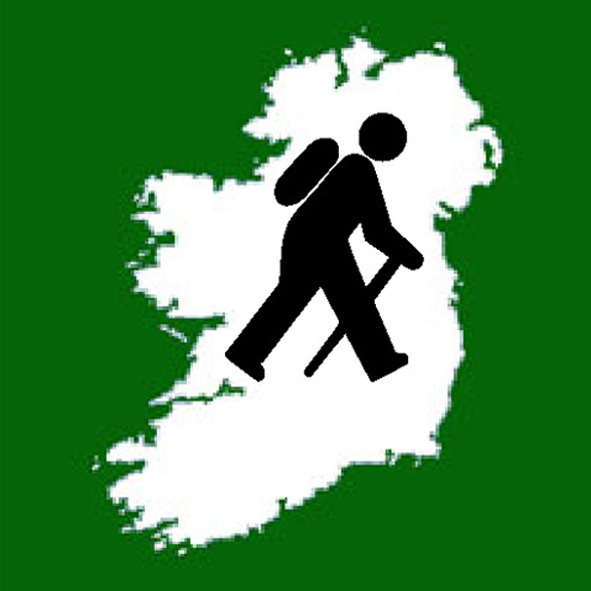 The Irish hillwalking community has been informally involved in high point “bagging” for a good few years now. Since the 1990s, County High Point bagging has proven itself to be a particularly popular personal challenge among hillwalkers in Ireland. 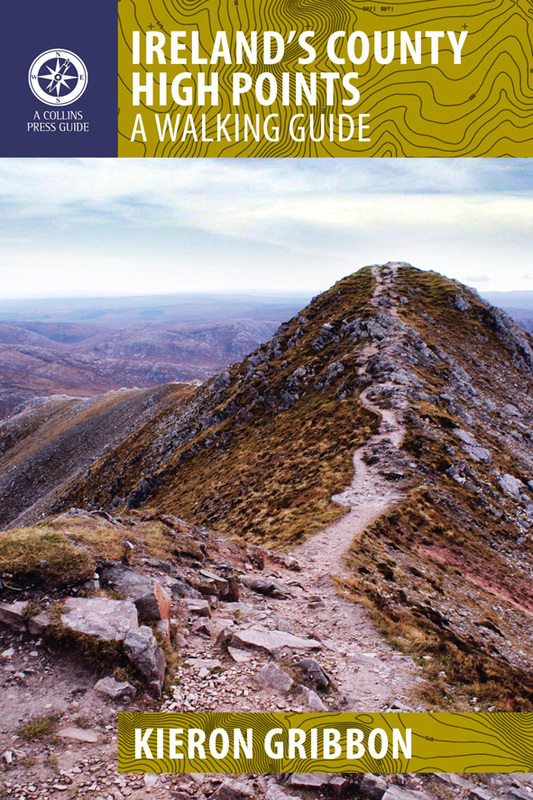 Its growth in popularity has been most significant since 2012 following the publication of Ireland's County High Points: A Walking Guide by Kieron Gribbon (founder of High Point Ireland). This book was the first serious initiative designed specifically to promote and develop County High Point bagging in Ireland. Soon after the guidebook was published, having recognised the makings of a new sport, Kieron set out to develop the informal activity of high point bagging into a recognised sport. The next stage in his strategy was to publish a comprehensive list of Ireland’s major geographical high points. This was published on 5th December 2015 as the book The Gribbons: A Complete List of Ireland’s Major Geographical High Points and on the High Point Ireland website. The book was published to serve as a permanent record of the Gribbon list’s publication and as an initiative in High Point Ireland’s wider campaign to raise money for Mountain Rescue Ireland. The High Point Ireland website was set up initially to function as an information resource for hillwalkers and geography enthusiasts, and also as a platform to raise money for Mountain Rescue Ireland. The next stage of the strategy was to introduce interesting new initiatives on the website in order to build a community of high point baggers. The initiatives introduced so far have included quarterly photo competitions, awards and certificates, and the Million Metre Challenge. In April 2017, Kieron Gribbon invented the words “Highpointeering” and “Highpointeer” in preparation for the launch of his new sport. On 18th May 2017, the sport of Highpointeering was born and these newly-invented words appeared throughout the High Point Ireland website. The introduction of the High Point Ireland Leagues as the first-ever all-Ireland Highpointeering competitions officially marked the arrival of the new sport. Participants enter these competitions as individuals in the hope of becoming one of the “Elite Ten” highest point-scorers representing their home county and province. In the year-long Counties League, the three counties with the highest combined “Elite Ten” point-scores will receive Gold (1st), Silver (2nd) and Bronze (3rd) awards. Similarly, in the year-long Provinces League, the three provinces with the highest combined “Elite Ten” point-scores will also receive Gold, Silver and Bronze awards. In addition, the Highpointeer of the Year awards competition Gold, Silver and Bronze awards will be received by the three highest point-scoring individuals. In all of these open competitions, men and women, young and old, can compete with and against each other on an equal footing. At High Point Ireland, we are totally committed to an “equality for all” approach to participation in the sport of Highpointeering. ​As a result of having introduced all these initiatives, Highpointeering has established itself as a true sport with High Point Ireland as its natural all-Ireland governing body. 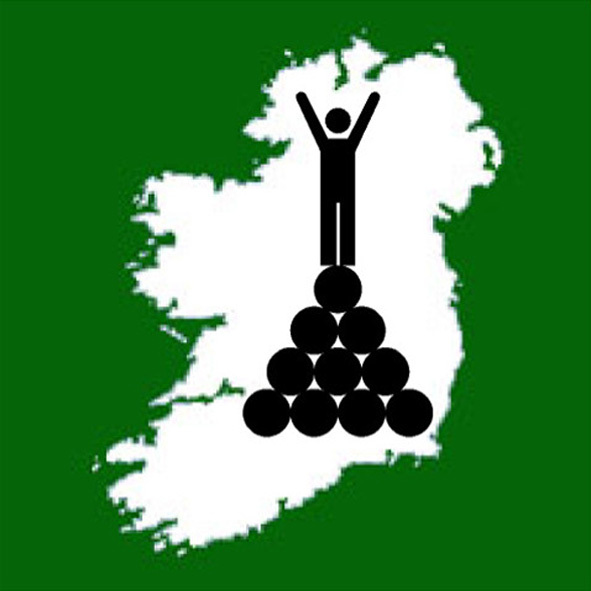 Ireland is the first region in the world where High Point bagging has been developed in this way to successfully make the transition from being an informal leisure activity to becoming a sport in which individuals and sub-regions can compete with and against each other. Ireland’s convenient size, geography and topography have made this transition relatively straightforward compared to how it might be in other parts of the world. Going forward, the next stage in developing the sport of Highpointeering in Ireland is for it to become a Recognised Sport and for High Point Ireland to become its National Governing Body. As the first region of the world to embrace Highpointeering as a competitive sport, Ireland has great potential to be recognised as a key player in its global development. In the future, other regions may even create their own Highpointeering governing bodies based on the High Point Ireland model. We received five entries in our Spring 2017 #HighPointIrelandPhoto on 20th February 2017. After a full week of voting on Twitter, the five entries received a combined total of 97 "likes". 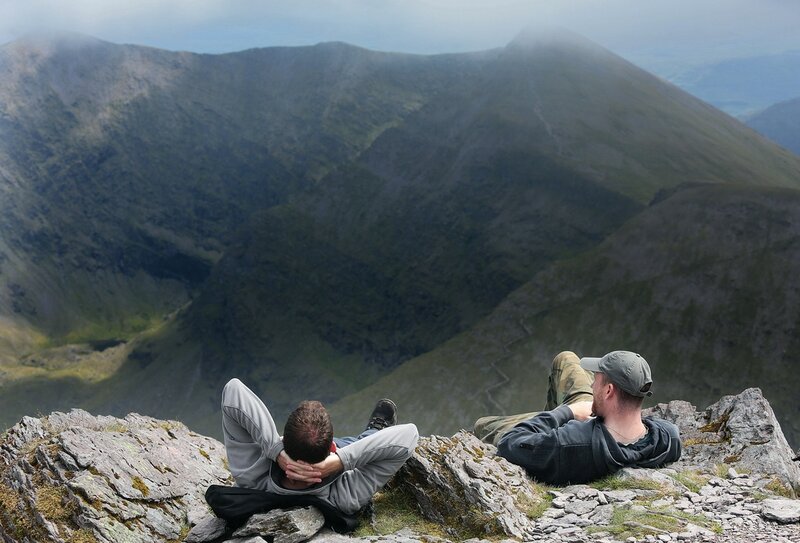 Of these, 47 were received by the winning photo of Carrauntoohil submitted by Anthony O'Donovan (@anthonyodonovan). Congratulations Anthony! Your photo will become the header image of the High Point Ireland homepage, blog page, Twitter account, Facebook page, and the High Point Ireland for Mountain Rescue Ireland and Million Metre Challenge fundraising pages during March, April and May 2017. 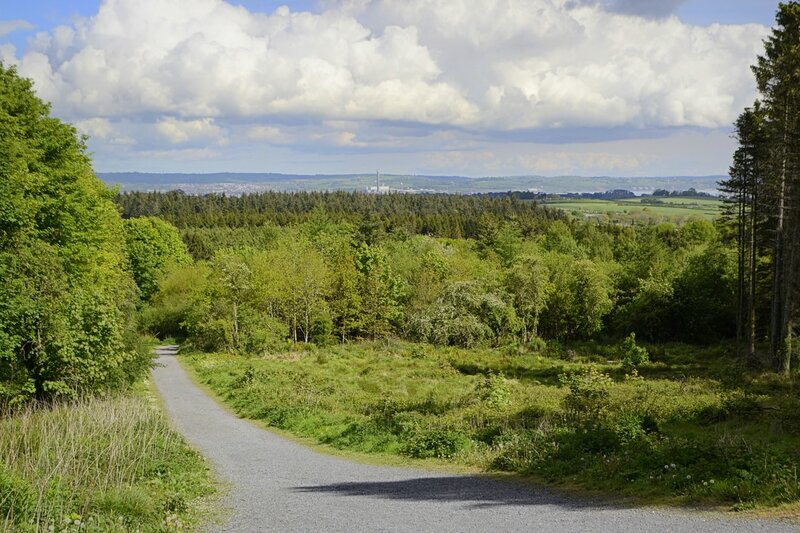 In addition, your winning photo will appear during those months as the header image of The Ireland Walking Guide's Twitter account and Facebook page. It will be also displayed permanently as a winning photo at the bottom of the photo competition page. Thanks to all five entrants for taking part, and to everyone who voted for their favourite in the Spring 2017 #HighPointIrelandPhoto competition. If you would like to take part in the Summer 2017 #HighPointIrelandPhoto competition, please note that entries will be accepted on 20th May 2017. 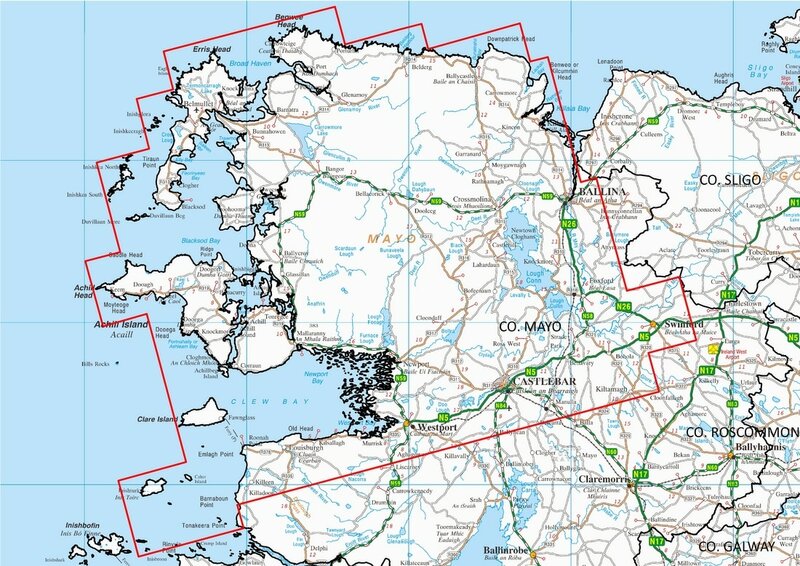 The next phase of Tellus – a geological mapping project which collects geophysical and geochemical data on rocks, soil and water across Ireland – is set to ‘take off’ over counties Mayo and Donegal in early March. 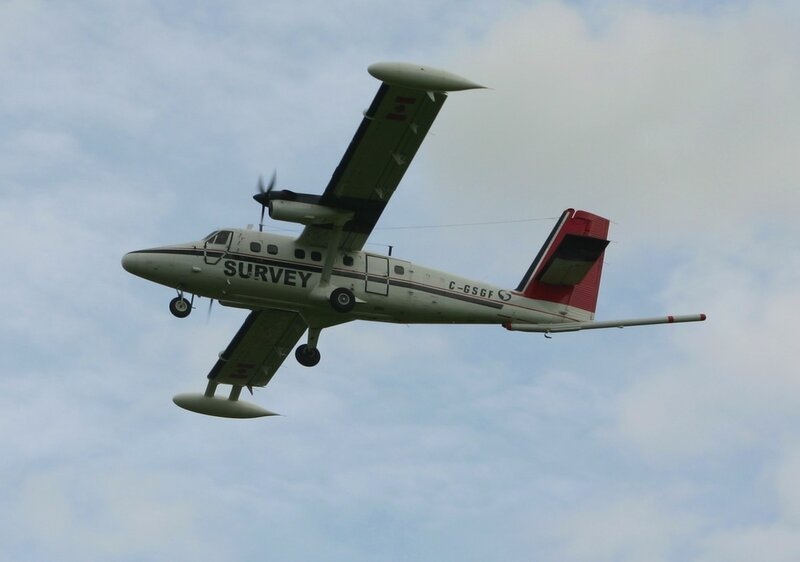 This latest geophysical phase of the survey involves a low-flying plane, equipped with state-of-the art technology, traversing the skies across County Mayo and western County Donegal. The aircraft, based at Sligo airport, will be in the air from March 2017 to late autumn 2017 (weather permitting). 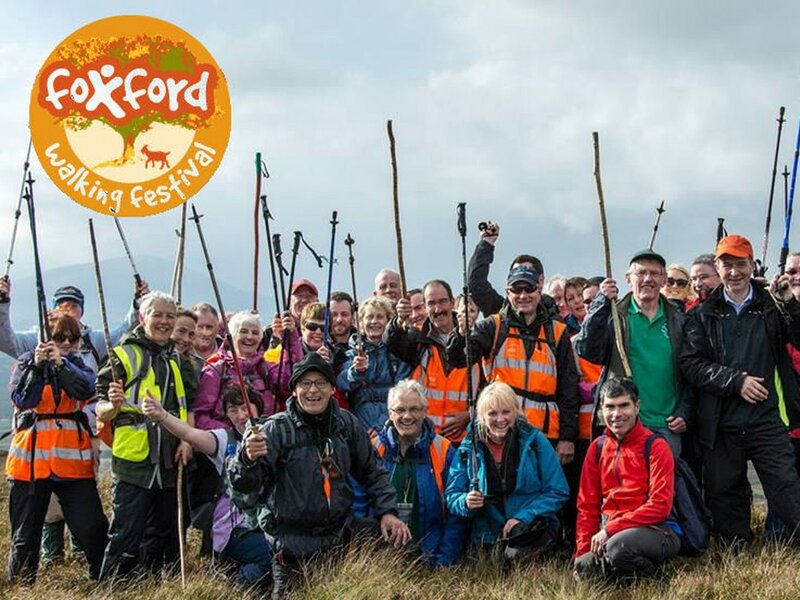 During this time, it will traverse over 42 Gribbon locations (listed in full below) including Mweelrea, the highest point in the province of Connacht, and historic pilgrimage trail, Croagh Patrick. The survey activity will help better identify and map variations in the rocks and soils, which will assist in understanding the local environment, soil management and natural resource potential for these counties. Hillwalkers and outdoor enthusiasts are advised that the aircraft will fly at a level of 60 metres over rural areas (approximately eight times the height of a standard two storey house), rising to 240 metres over urban areas. The sound of the plane is similar to that of a passing lorry; however it may startle sensitive livestock such as horses, pedigree cattle, sheep-in-lamb and poultry flocks. As it is vital to raise public awareness of the project, particularly amongst farmers and animal owners - the Tellus team is delivering an ongoing communications campaign across the regions. If you have any concerns about the survey, particularly if you own sensitive livestock, or if you are interested in finding out more about the project, you can contact the Tellus Freephone information line on 1800 303 516 or visit www.tellus.ie. You can also follow Tellus on Twitter, @TellusGSI. This article was contributed by the Tellus survey team. On Twitter, voting is currently underway to decide which #HighPointIrelandPhoto will become the header image on the website’s homepage and blog page during March, April and May 2017. Five qualifying entries were tweeted on submission day (20th February 2017) of our Spring 2017 #HighPointIrelandPhoto competition, each one demonstrating the beauty of the Irish uplands. For the duration of the voting period, all five entries will be listed as our Twitter likes. The original tweets can also be accessed via the clickable slideshow below. To vote for your favourite, all you need to do is give it a "like" on Twitter. Voting closes at midnight at the end of 27th February 2017, and the winning entry (the one with most “likes”) will be announced the following day. The winning photo will also become the header image of the High Point Ireland Twitter account, Facebook page, and the High Point Ireland for Mountain Rescue Ireland and Million Metre Challenge fundraising pages during March, April and May 2017. 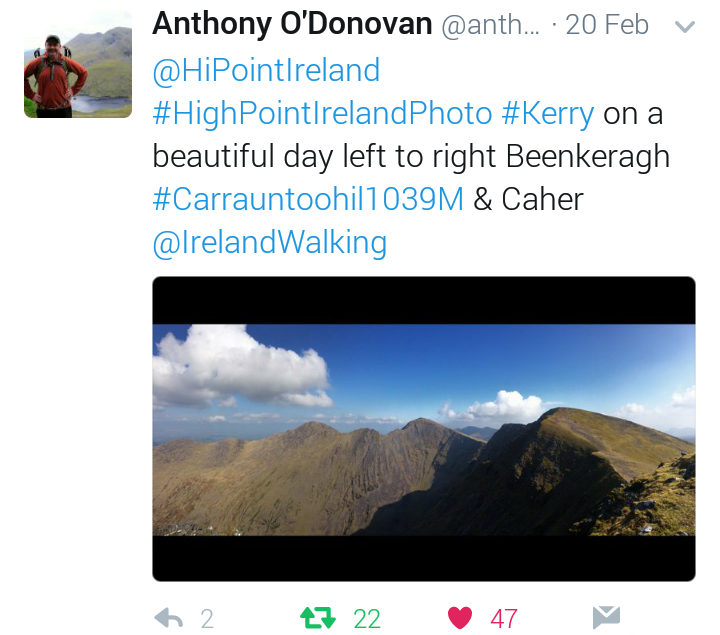 In addition, the winning photo will appear as the header image of The Ireland Walking Guide's Twitter account and Facebook page. It will be also displayed permanently as a winning photo at the bottom of the photo competition page. Good luck to our five entrants, and thanks to everyone for getting involved. 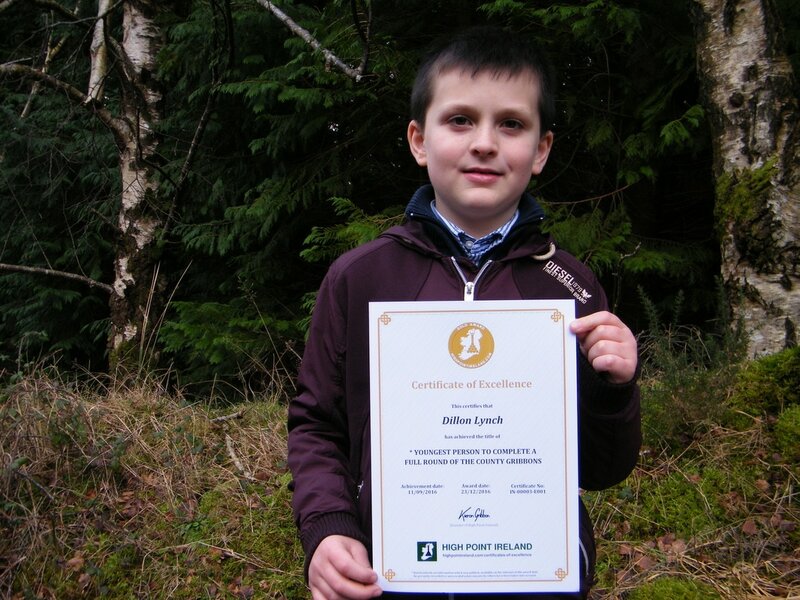 In 2016, Dillon Lynch from County Cork became the youngest person to visit all the County Gribbons. Here, Patrick O’Brien tells us about his son’s follow-up challenge: to earn High Point Ireland's first-ever Highpointeer of the Year Gold Award. 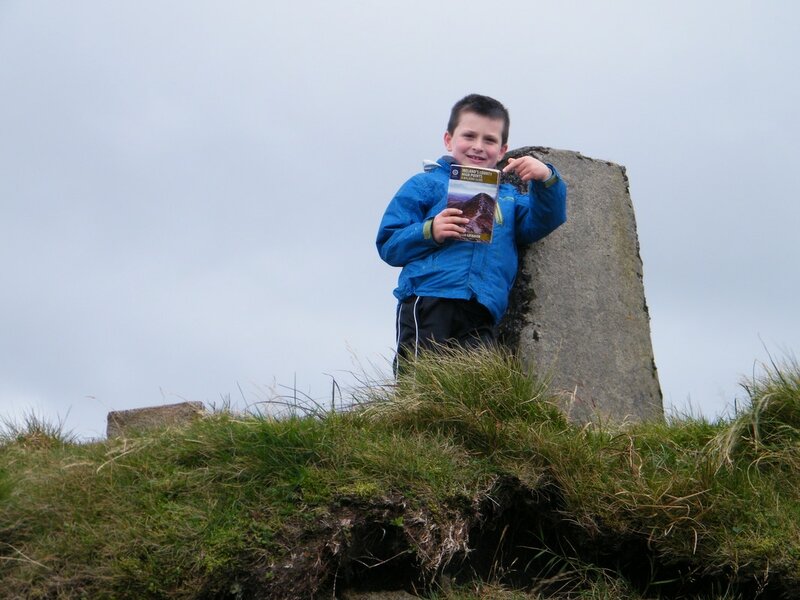 On 11th September 2016, Dillon completed his 32 Counties High Point Challenge to become the youngest person to complete the County Gribbons. His efforts to accomplish the challenge have been acknowledged by High Point Ireland in the form of two Silver Award Certificates of Completion and a special Gold Award Certificate of Excellence. When people heard about Dillon’s achievements, many of them asked, “What’s your next challenge? ", Dillon’s reply was “Oh, just take it easy for a while”. 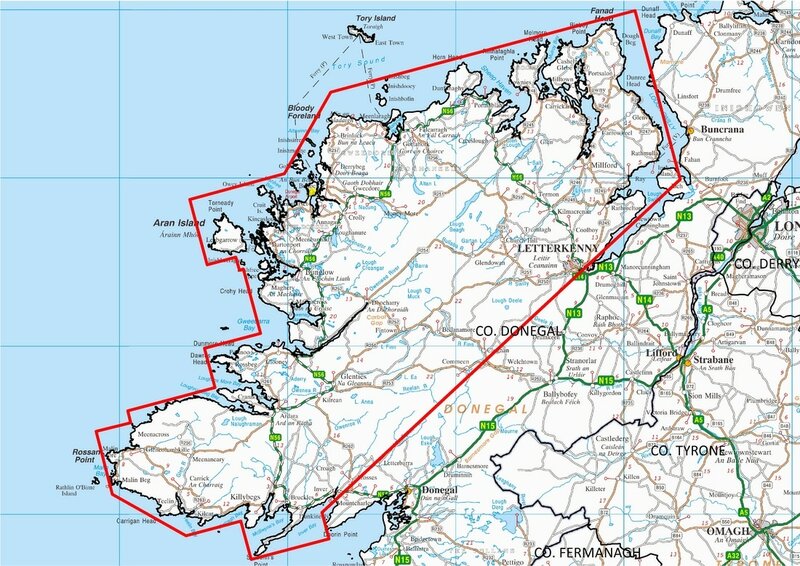 However, we had never expected High Point Ireland to present that next challenge to us so soon. Not only that, it had a deadline of 31st December 2016. The goal of the challenge was the Highpointeer of the Year 2016 Gold Award. High Point Ireland's Highpointeer of the Year award category is based on a calendar year, so we could not score any points for the 8 County Gribbons we had visited in 2015. We suspected that Dillon was probably down on points compared to others who had visited all the County Gribbons during 2016. The rules for Highpointeer of the Year allows participants to earn points for up to 4 visits to each of the 186 Gribbon locations during the same calendar year (provided there are at least 5 whole days between the repeat visits). We identified the nearest Gribbon locations and set out a plan to fit in as many visits as possible before the end of December. We started on the evening of 9th December 2016 by climbing Knocknaskagh the highest point in the Nagles Mountains (#Knocknaskagh427m). Over the following 22 days up to and including 31st December we had walks on 11 days comprising 15 visits to 7 different Gribbon locations totalling approximately 83km distance and 4,500m ascent. Most of these walks started early in the morning so we couls accommodate School, Karate, Coder Dojo and Christmas preparations. A measure of the commitment by Dillon here is the fact that he was on the summit of Galtymore Mountain 3 times in December, all before 9am (on one of those days he also climbed to the summit of Knockmealdown). Arderin was where we resumed our CHP challenge in April of 2016 after the winter break so it was very fitting to finish the year there too. In early January, High Point Ireland announced the winners. Dillon was thrilled with first place and delighted to receive another Gold certificate. This time, it was for the Highpointeer of the Year 2016 Gold Award. Looking ahead to the rest of 2017, I am sure we will have many more adventures on the hills and mountains of Ireland. Even though they are not too far from us, we have never been to the Comeragh Mountains. They are definitely on our visit list. We must climb Fauscoum while we are there. 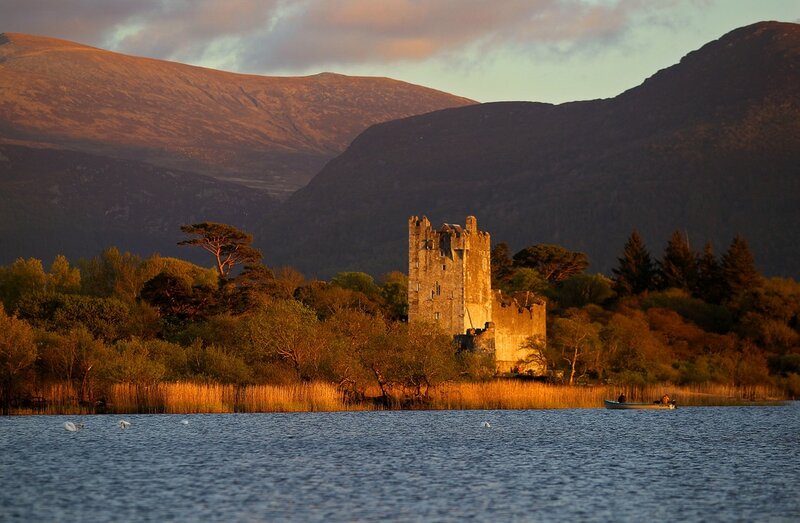 Further afield, who knows what other parts of Ireland we will visit for weekends away and Summer holidays. Wherever we decide to go, one thing is certain: the Gribbon list will be consulted. Words and photos contributed by Patrick O'Brien. Visiting Ireland's County High Points (the County Gribbons) has become a popular challenge for Irish hillwalkers in recent years. Here, Patrick O’Brien tells the inspirational story of his son’s 32 Counties High Point Challenge. Dillon Lynch from Kildorrery, Co. Cork, joined me (his dad) in the challenge of climbing to the highest point in each of the 32 counties of Ireland. At the start we were just climbing local mountains, unaware that such a challenge even existed. When we learned of the challenge, we realised we had the County High Points of Munster almost complete. 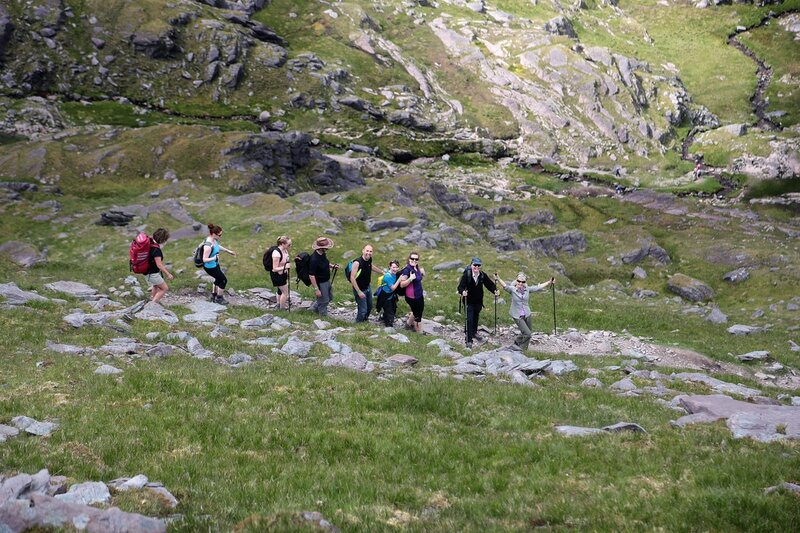 Beginning on 26th June 2015, our 32 County High Point Challenge would involve traveling the length and breadth of the country, and walking nearly 200km in mostly mountainous terrain. With skills learned in a Coder Dojo Class, organised and run for free by Cloyne Diocesan Youth Services (CDYS) in Mallow, Dillon created the 32 Counties High Point Challenge website to document and keep track of his challenge. We also maintain a Facebook page for the challenge. Returning to the challenge in Spring 2016, we decided to use the challenge to raise funds for Kildorrery Karate Club and Cloyne Diocesan Youth Services (CDYS) Mallow. Sponsorship cards were in circulation over the summer but as a second method of fundraising, the website also had an area for businesses to advertise. Each advert appeared on all pages of the website and were visible as people browsed the website. The adverts were very successful, adding greatly to the funds raised. Dillon proved himself as quite the salesman, presenting his idea and website to the potential businesses. On 11th September 2016, at the summit of Trostan, Dillon completed his 32 Counties High Point Challenge. By doing so, he also became the youngest person to have climbed all the County High Points in Ireland. 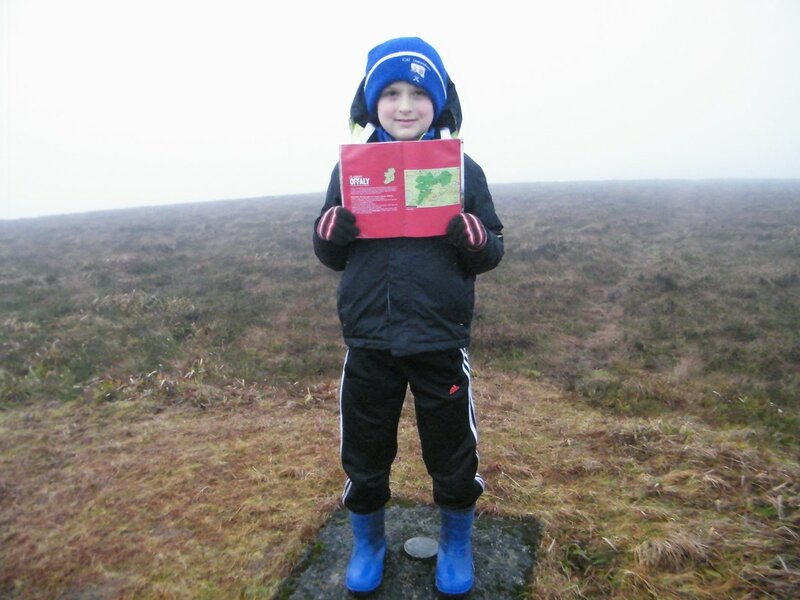 Dillon was delighted to meet with Kieron Gribbon, the author of Ireland's County High Points: A Walking Guide (a must have book for anyone doing the County High Point challenge). Kieron took time out to meet Dillon in Belfast on the evening of the final climb. We all had a great chat for a few hours about the book and the many adventures of the challenge. The real end of the challenge took place on Saturday 15th October with an interview on CRK FM followed by a celebration and cheque presentation in Sheahan’s Bar Kildorrery. Dillon began by thanking everyone that supported the fundraising, anyone that helped with the completion of the climbs and everybody involved in preparing for the celebration night. He then presented a cheque of €1,670 to Cloyne Diocesan Youth Services in Mallow followed by a cheque for the same amount to Kildorrery Karate Club. Dillon went on to congratulate his club colleagues of Kildorrery Karate Club on their recent success in the SKDUN World Karate Championships in Bulgaria. Members of the club displayed some of their karate moves for everyone to enjoy. A great night was had by all with great music singing and dancing provided by Dillon’s sister, Rachel Lynch and her friends, Ciara Dunne, Micheál Fogarty, Anna O’Sullivan, Éanna Hyland and with lots of amazing participation by others making the night even more spectacular. 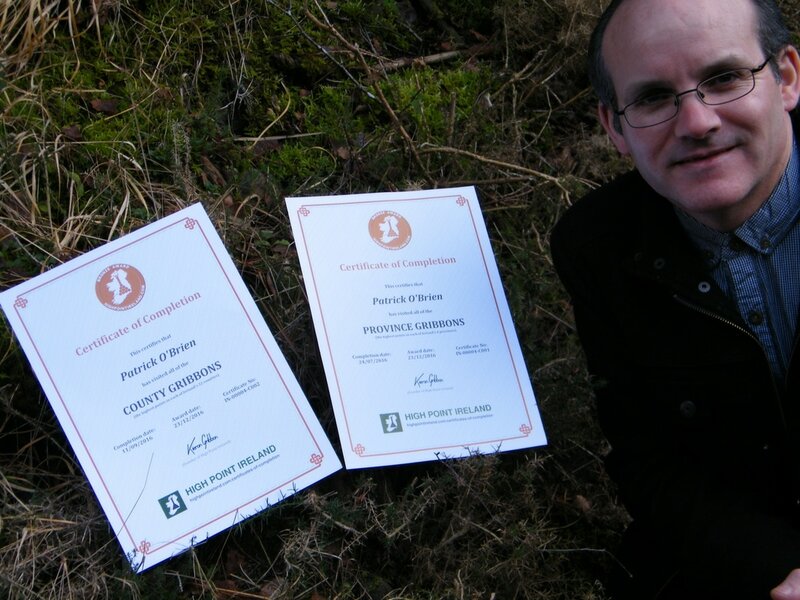 Kieron Gribbon, as founder of High Point Ireland, awarded Dillon and I “Certificates of Completion” for having visited each of the Province Gribbons and County Gribbons. Dillon earned Silver certificates as he had a photo at every high point and I was happy to earn a Bronze cert in each case. Dillon also received a special “Certificate of Excellence” for being the youngest person to complete a full round of the County Gribbons. Words and photos by Patrick O'Brien.